Since its introduction to Queensland in 1935, the cane toad (Rhinella marina) has spread westwards across northern Australia, is now present in all but one of the major regions of the Wet-Dry tropics, and has just started to spread into the last region – the pristine Kimberley wilderness. While a review of available data suggests that impacts of toad presence on amphibians to date has been limited, this might be about to change in the case of the Magnificent tree frog. The Magnificent tree frog (Litoria splendida) is restricted entirely to the Kimberley ranges and is larger and longer lived than most Australian frogs, making it prone to possible impacts through toxic lethal ingestion (at all life stages) and competition. In addition, an introduced parasitic lungworm that is carried by the toads has recently been shown to be transferable to Magnificent tree frogs and is known to significantly impact upon their survival and fitness. 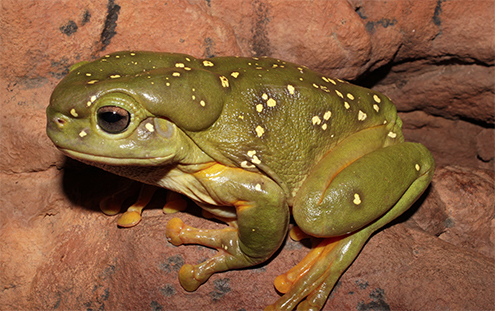 This project will investigate populations of Magnificent tree frogs in the wild (in the east Kimberley of Western Australia), examining aspects of their biology and ecology that might make them vulnerable to decline from toads. This project involves extended field work in the remote tropics of Western Australia and would suit somebody that is confident conducting fieldwork in remote places with minimal assistance at times (although it will also involve some makeshift laboratory experiments). Skills that will be developed throughout the project include conducting diurnal and nocturnal amphibian surveys (including mark-recapture); behavioural observations; stomach flushing to investigate diet; short and long-term movement tracking; some controlled laboratory experiments (toxicity trials); data analyses; and write-up for publication in peer-reviewed journals. Grant funding currently exists to support this project.